I know of nothing else that can ruin a company faster than a bad mood. Challenge me to turn around the fortunes of a company in the middle of the worst recession in history or at the height of a PR nightmare and I’ll take you up on the bet — if I know that my first order of business is work on changing the mood of the company itself. Simple. Mood is everything. Mood makes a company’s employees feel like their best days are ahead of them. That no matter what they’ve been through, or what they’re facing now, things are gonna get better. That kind of corporate-wide faith in the vision you hold for your company and its position in the marketplace can make all the difference in the world, and can stir up the kind of infectious passion that’s felt from the mailroom to the corner office. But it’s not always easy to affect mood change from the inside, which means that sometimes you’ve gotta turn the reins over to someone whose “been there, done that” track record inspires confidence and breaths new life into employee morale. That’s where a seasoned speaker comes in — someone who has a proven track record of creating motivation and building a culture for success within the workplace. In my bestseller, Running the Gauntlet, I write about how crucial it is to the mood and morale of your company — and, ultimately, its success — that you bring in people who are going to be better at motivating your employees than you are (or who will at least match your same level of intensity). 1. Use a speaker who is totally transparent and 100 percent authentic. Not too long ago, someone who had seen me deliver a keynote address wrote a blog post about where he basically said that I didn’t just give a speech; I delivered a performance that came across as authentic to me and my brand. That was the highest compliment he could have paid me. Because no matter what you think of me, whether you like me or you don’t, whether you like the content that I have or you don’t, I know that I’ll have your respect if I’m authentic. Being real goes a long, long way. It’s this kind of radical transparency and authenticity that builds trust in a speaker’s leadership among the rank and file. And no speaker or leader can establish trust with your employees if he or she isn’t true to who the person is and real about his or her message. 2. Vet potential speakers like you would prospective employees. Even though the person(s) you hire to speak to your employees may only be around for a few hours, it doesn’t mean that you shouldn’t vet them with the same scrutiny that you would a potential new-hire. Are they a fit? Would you want them around even after the talk is over? So treat your review of each candidate’s speaker profile for what it is: their brand — their promise delivered. Do you see them flying the company colors? And then, make sure that their brand is a good fit for yours. What’s their UVP — their unique value proposition? What sets them apart from all the other prospective speakers? Value is an emotional connection made between speaker and audience, so it’s imperative that you know how the speaker you hire is going to satisfy that connection. 3. Choose a speaker that will go above and beyond to engage and challenge your audience. 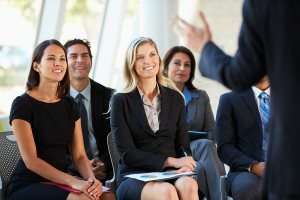 Just as success in the marketplace revolves around your ability to connect with your customer and surpass his expectations, the speaker you hire to motivate and inspire your audience to higher performance levels must be able to deliver an extraordinary experience. A powerful presentation is one that engages the senses to drive the speaker’s message home in a way that’s unforgettable. How will the prospective speaker incorporate technology into his or her presentation? Is the person’s approach leading edge? Innovative? And what would happen in the event of a technological glitch? Would the message suffer, or could the speaker carry the day anyway? The right speaker will help your team move from great to exceptional, not by just going through the motions, but by going above and beyond to drive their message home. In business, leading your team through a period of change will require that you have the courage and know-how to break through whatever present boundaries or limitations the team is currently facing. You can make that journey that much easier when the team is inspired to take action and is guided by the expertise of someone who knows how to use the stage as a platform to deliver the kind of powerful punch that gets results. But just like anything else in marketing, when it comes to hiring the right speaker for the job, passion is paramount if he or she is going to have any lasting impact on your company’s message, efforts, brand — and, most important of all — morale. Choose one that meets all of the requirements listed above, and you and your team will be well on your way to making the kind of radical changes that bring success. Jeffrey Hayzlett is a global business celebrity and primetime television show host on Bloomberg Television. From small businesses to international corporations, his creativity and extraordinary entrepreneurial skills have enabled him to lead ventures blending his leadership perspectives, insights into the c-­-suite and business strategy, mass marketing prowess and affinity for social media. He is a well-­-traveled public speaker, the author of the bestselling business books, The Mirror Test and Running the Gauntlet, and one of the most compelling figures in business today. Jeffrey is a leading business expert, cited in Forbes, SUCCESS, Mashable, Marketing Week and Chief Executive, among many others. He shares his executive insight and commentary on television networks like Bloomberg, MSNBC, and Fox Business. Jeffrey appeared as a guest celebrity judge on NBC’s Celebrity Apprentice with Donald Trump for three seasons. Drawing upon an eclectic background in business, buoyed by a stellar track record of keynote speaking and public appearances, and deeply rooted in cowboy lore, Jeffrey energizes his role driving and delivering change. He is a turnaround architect of the highest order, a maverick marketer who delivers scalable campaigns, embraces traditional modes of customer engagement, and possesses a remarkable cachet of mentorship, corporate governance, and brand building.